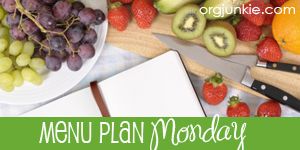 Click here to download my Weekly Plan / Meal Plan Template (It’s slightly different this week). Yes, this post is up rather late this week. We met up with our Mums Group for lunch on Sunday and then celebrated Mr Monkey’s birthday on Sunday night with family and friends. I had the meal plan mostly ready by Saturday night but hadn’t put the post together. We also weren’t entirely sure what was happening this week – it had been organised for tradesmen to come in Monday to Wednesday to finally fix our kitchen floor. The original plan was for Lily and I to go down to my parents’ house for those days, just because it was easier. But then we realised that Mr Monkey had to work Tuesday and Wednesday and there would be no one there to let the tradesmen in and out of the house. So Lily ended up going home with my parents on Sunday night and I was going to stay home those three days. However, that all changed on Monday morning when the tradesman let himself in to our house, with a key given to him by the landlord. After finally getting hold of the real estate we discovered that they assumed we wouldn’t actually be in the house for those three days. I’m not sure where they got that idea from as nothing was actually mentioned about it in the *minimal* planning that was done in the lead up. They had given us a week’s free rent while the work was being done but had told us it was for the “inconvenience” – we took this to mean the inconvenience of having tradesmen in our house, no access to a kitchen, having to move our fridge and possibly not having direct access to the bathroom (we can access it by going out on the street and coming in the back gate). However, they seem to have meant the inconvenience of having to find somewhere else to stay for those three days. So, I ended up catching the train down to my parents’ house and we have gone back to the original plan of staying here until we go back up on Thursday for my midwife appointment. Mr Monkey is still staying home but shouldn’t be much of an inconvenience to the tradies as he’s only there before work in the mornings and after work late at night. So we weren’t sure what was happening for those 3 days/nights but now that we know we can plan the rest of the week. Of course, that is assuming that the floor will be finished tomorrow and we will have access to the kitchen on Thursday. So, I’ve planned the old favourite Giovanni’s Sausages with Potatoes & Rosemary. I love how easy this meal is – you just chuck everything in a pan and then in the oven, serve with a simple salad. I will just have to make sure to include heaps of veggies and make a bigger salad so that I don’t have too many carbs. Lily is at school on Friday and while she is given dinner there she sometimes is still hungry for when we have dinner at home. I try to make something that I know she’ll eat for that reason, although I tend not to do pasta as she normally has pasta for lunch. So, a simple chicken and vegetable risotto it is! We actually haven’t had risotto in ages and Lily loves it. Once again, lots of veggies and perhaps a side salad for me as well. On Saturday I’ll be making the old winter favourite Spring Pea Soup. I’ll hopefully make up a double batch and freezing serves to have easy meals after the baby is born. It’s such an easy, yummy meal to reheat with a piece of toast. On Sunday I’ll hopefully be at the Buddhist Centre in the afternoon so Mr Monkey will have to organise dinner. I’ve planned Steak with Béarnaise Sauce with salad and chips. I had this meal on the meal plan the week that I was diagnosed with Gestational Diabetes and without really thinking about it I automatically took it off the menu. However, looking closer at the recipe it seems that the steak and sauce themselves actually have a very low amount of carbs and I will just have to be smart with how much chips I have and obviously a bigger salad. It’s probably not a meal that I could order when eating out at the moment but as long as I am smart with it at home (especially with Mr Monkey to help) I should be ok. But I suppose I’ll see what the blood sugar levels say afterwards! Well, this was a long post! And a late one at that! !